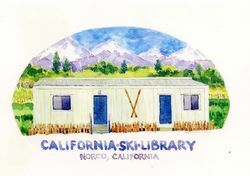 The California Ski Library is located in the city of Norco in Southern California. Use of the Library is free and open to the public by appointment. Visitors may call or email to arrange an appointment. Please contact us with your request. The collection currently numbers approximately 4,000 books, hundreds of magazines, almanacs, annuals, and thousands of pieces of ephemera including: brochures, broadsides, catalogs, programs, announcements, newsletters, posters, and advertisements. Ingrid P. Wicken founded the California Ski Library in 2005, but the collection began long before that. 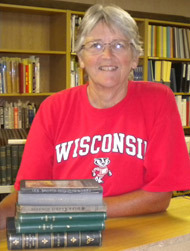 In the 1980's, while a graduate student at California State Polytechnic University Pomona, and an avid cross-country skier, Wicken began purchasing books on cross-country ski teaching and technique. She especially sought out technical titles while working on her Master's theseis: "A biomechanical comparison of the diagonal stride on skis and roller skis." The collection continued to expand throughout the 1980's and 1990's, growing exponentially with the advent of the Internet and the access it permitted for world wide access to books once thought unobtainable. Because of the size and breadth of the collection, Wicken purchased and placed a 24' X 40' portable building on her property to house it, shown here in an artist's watercolor. *To acquire historically significant material pertaining to skiing in the United States, especially the West. *Process, preserve, and catalog the materials. *Provide public access to all researchers, journalists, students, and others interested in skiing history. Ingrid has been a ski book collector since the 1980s. She earned her Bachelor's and Master's Degrees in Physical Education from California State Polytechnic University, Pomona. Her Master's thesis was a biomechanical investigation of the diagonal stride on skis vs. roller skis. She is a Professor of Kinesiology at Moreno Valley College.